Sue Forgue (www.reg-ency.com) is an accountant and founder of the research website The Regency Encyclopedia. She has presented at several JASNA AGMs and regions and contributed articles to the Letter from Chicago newsletter, JASNA News, and Jane Austen Knits, serving also as one of its historical consultants. for over two centuries Mr. Darcy and readers of Pride and Prejudice have sought out George Wickham and Lydia Bennet’s love nest in London. There are few clues provided in the novel, all of them revealed in letters to Elizabeth: Darcy’s letter defending his character after the Hunsford proposal in volume II, chapter 12, and Mrs. Gardiner’s letter explaining Darcy’s involvement in Lydia’s marriage in volume III, chapter 10. 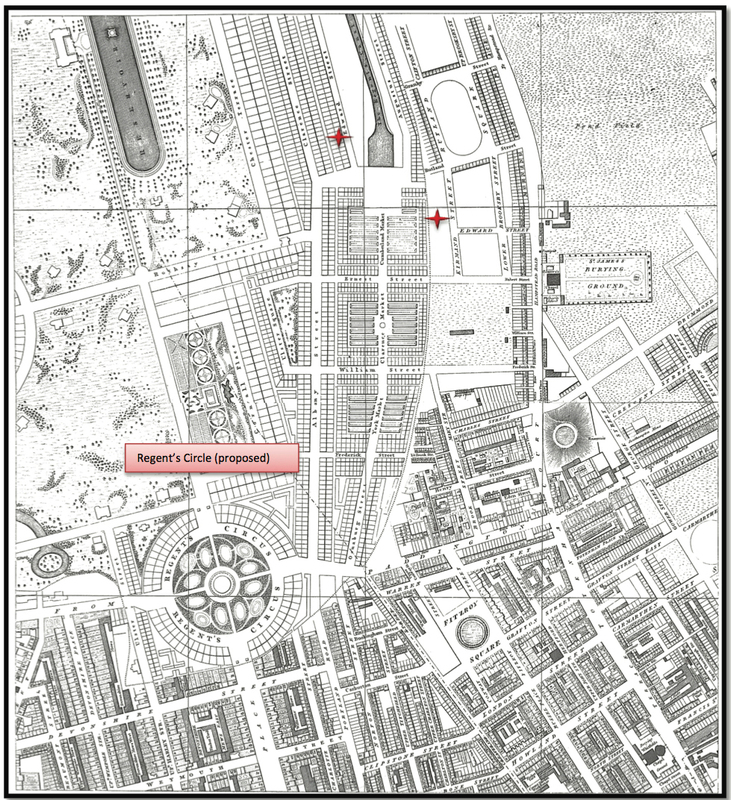 This essay endeavors to seek out and analyze further clues to the locations of both Mrs. Younge and the eloping Wickham and Lydia by looking at a very detailed period map of London. The search for Lydia and Wickham takes place in London, as Mr. Bennet opines, “‘[W]here can they be so well concealed?’” (330). In this supposition Mr. Bennet is entirely correct as John Feltham reports the following statistics in The Picture of London for 1803: “According to Mr. Colquhoun, London contains 8,000 streets, lanes, alleys, and courts; 60 squares; and 160,000 houses, warehouses, and other buildings” (14). After the disastrous scene at Hunsford, Darcy’s letter to Elizabeth first reveals the existence of Mrs. Younge and her “‘prior acquaintance’” with Wickham (224). With Wickham’s parents deceased and no other family or friends mentioned who could assist him in his present situation, the obvious direction for Darcy is quickly to locate Mrs. Younge to ask, and probably bribe, her for information on the fugitive pair. Mrs. Gardiner’s letter reveals that after her dismissal, Mrs. Younge “‘took a large house in Edward-street, and has since maintained herself by letting lodgings’” (356). However, on Richard Horwood’s 1813 map of London there are eight Edward Streets in six different locations. Does Darcy visit them all, hunting for that large house? Are there clues that would help him and us narrow the search? Mrs. Younge’s history actually provides many clues to her location. The Darcy family would have required a lady of gentle breeding and refinement for the charge of Miss Darcy’s education. The obvious source for such a lady would be among the daughters and widows of the clergy. The only profession at the time requiring advanced university training was a clergyman in the Church of England. According to Irene Collins in Jane Austen and the Clergy, “In Jane Austen’s day, it was virtually impossible to become ordained in the Church of England without a degree from one or other of the country’s only universities, Oxford and Cambridge” (19). Many clergymen supplemented their parish earnings by preparing the sons of the local gentry and aristocracy for entry into the public schools and universities, as Jane Austen’s own father did. The wives and daughters of these men were often among the best educated women in the kingdom. Collins tells us that “they would have experienced a more academic background” (Parson’s Daughter 34) because of the easy availability of the many scholarly volumes normally found in a clergyman’s library. As there was also an expectation that clergymen’s wives and daughters would be their children’s first teacher and operate a dame school for the poor children of the parish, these ladies would need to be well educated. A clergyman’s widow could be left in dire circumstances. Maggie Lane points out that clerical widows “were, as a rule, doubly or trebly unfortunate, in that they lost not only husband but home and income at the moment of his death” (72). If Mrs. Younge had no other male relations to provide her with assistance—such as the monetary allowance Jane Austen’s mother received from her sons—she would need to find both a home to live in and a genteel means of earning an income. Ladies who found themselves in this situation often became governesses or companions. Sheryl Craig claims, “Usually the orphans of poor clergymen, governesses were unlikely to be relatives of their employers and generally seem to have been treated rather shabbily” (18). As Darcy tells Elizabeth in his letter, Mrs. Younge was hired when Miss Darcy’s formal education was completed and “‘an establishment formed for her’” (224) in Darcy’s London home. Mrs. Younge’s duties probably included overseeing Miss Darcy’s masters in music, dancing, art, and the modern foreign languages, acting as chaperone for outings to museums, concerts, and exhibitions, and, in general, teaching and polishing Miss Darcy’s social skills for her eventual debut and presentation. Mrs. Younge’s susceptibility to a rogue like Wickham is quite understandable. Malcom Day provides a brutally honest description of a governess’ life: “The spinster governess suffered ignominiously from social stigma. Not treated as an equal by the heads of the house and not inclined to associate with the servants, she was virtually shut away from society like a prisoner. In some cases she became prey to the nastier instincts of those who chose to exploit her social vulnerability” (61). After the aborted elopement at Ramsgate, Mrs. Younge, as Darcy tells Elizabeth, “‘was of course removed from her charge’” (225). These few words would mean more for a reader of Austen’s time than merely that an employee had been fired. Because of the “‘connivance and aid’” (224) Mrs. Younge had given to Wickham, a proper letter of reference would not accompany her final wages. Without such a letter, any thought of future employment as a governess or companion with any family of quality would be dashed. Mrs. Gardiner’s disclosure that Mrs. Younge now supports herself by “‘letting lodgings’” (356) might be more ambiguous than it appears. This characterization was often a euphemism for becoming a prostitute or a madam in a brothel. Captain Francis Grose’s Dictionary of the Vulgar Tongue, published in 1811, provides examples and defines the slang expression “Room”: “She lets out her fore room and lies backwards: saying of a woman suspected of prostitution.” Another of Grose’s definitions is a little nicer in tone but still not the most delicate: “House, or Tenement, to Let. A widow’s weeds; also an achievement marking the death of a husband, set up on the outside of a mansion: both supposed to indicate that the dolorous widow wants a male comforter.” If Mrs. Younge can lure a well-educated but innocent Miss Darcy to a life with Wickham, where, as Elizabeth feels about Lydia’s marriage, “neither rational happiness nor worldly prosperity could be justly expected” (339), how many other impressionable young girls could be seduced into a life crudely described as having “come upon the town” (342)? But such a history seems unlikely to apply in this case. If Mrs. Younge already had a house in London, why would she seek other employment in the first place? And if she were not of the requisite breeding, would Mr. Darcy even consider summoning her for an interview? The later Victorians or the more Puritan among us would probably advise Mr. Darcy to begin the search in the eastern end of Harwood’s composite map, especially if the suspicion is that Mrs. Younge is now involved in prostitution. Ladies of the night, however, were found in every neighborhood in London, as Jane Rendell writes: “In the early nineteenth century, brothels were located all over London, in Mayfair, Marylebone and Docklands, but the most exclusive houses were to be found to the west and the lowest to the east and in the slums of St. Giles’s in Covent Garden” (132). No Edward Street location can be automatically disqualified. The first two locations to be considered, Limehouse and Stepney, are hamlets located on the banks of the Thames and are the farthest to the east. Stepney is the much older of the two, and its parish church of St. Dunstan’s stands on the site of the first Christian settlement east of London. Limehouse was carved out of this parish in 1729. While no buildings of distinction can be found here, there are two very important commercial routes that run through this area: the Commercial Road and the Limehouse Cut, a basin for canal traffic that eventually connects to the Regent’s Canal, the other end of which is north of Regent’s Circle. Both of these were built to improve the transportation of cargo between all areas of London and the major docks, located farther east. There are Edward Streets in both Limehouse and Stepney. With the emphasis on transporting goods, the area is populated with sailors and other workers in the shipbuilding trades. Generations of immigrants often would settle first in these parishes in very substandard housing. Though a typical land lease was 99 years, here in the eastern hamlets, tenants could let on very short leases of 31 years. In The East End Alan Palmer explains the unusual urban planning: “the persistence of the ancient copyhold system of tenure ruled out rich rewards for speculative investment on a large scale. Semi-independent copyholders might lease their land for no longer than thirty-one years under penalty of forfeiture to the lord of the manor for any infringement of his rights. So curious a restraint helped to make land cheaper, but it also favoured the spread of small houses, haphazardly packed into narrow streets” (16-17). Though built very haphazardly, these newly developed terraced houses were considered an improvement over the rundown medieval hovels they replaced. But while short-term profits were made in real estate development, those gains were not without considerable cost as the overcrowding and lack of proper sanitation led to frequent epidemics. It’s difficult to envision Wickham’s situating himself in a neighborhood where he could fall prey to a fatal illness. Mrs. Younge could have established herself in either of these towns as the housing was cheap and there were many lower class inhabitants to rent to. Most especially if she were using her rooms for prostitution, there would be a great number of transitory men eager, after months at sea, to pay for her services. Beyond the risk of illness, however, there are significant arguments against this location. The area was not only a great distance but a world away from what Mrs. Younge would have been accustomed to with the Darcys. Her refined speech and clothing would make her a fish out of water. One assumes that if Mrs. Younge were genteel enough to fool Miss Darcy’s guardians, she would want to continue maintaining the semblance of that gentility for as long as possible. Bethnal Green, another parish split off from Stepney, in this case in 1743, was yet another working man’s neighborhood. This area and nearby Spitalfields were the site of frequent riots fought over wages and the hiring of immigrant workers over native Britons. The Spitalfields Acts of 1765 instituted fairer pay practices, which initially calmed the situation, but when cotton manufacture overtook the weaving of silk in 1785, the price controls set by law idled many looms and left unemployed many workers. During the Napoleonic Wars French silk was embargoed, and the production of woven goods increased as the British were forced to supply their own locally made luxury fabrics. After the war, however, the combination of the economic downturn across Britain and the legally imposed wage and price controls forced manufacturers to set up shop outside of London where they could pay workers less and charge customers more in direct contradiction to the Spitalfields Acts. Eventually, recognizing the failure of these laws, Parliament repealed the Spitalfields Acts in 1824. Most of Bethnal Green was very populous both in number of buildings and inhabitants. J. Norris Brewer in his 1816 survey describes it as “being inhabited chiefly by journeymen silk weavers, who exist in a state of crowded misery and work at home for master weavers in Spital-fields (sic)” (279). However, its Edward Street, located on the Green and developed in 1770, is quite clear of slums. Brewer again comments that the houses surrounding the green are “of a respectable, but not of a very inviting character” (279). “Respectable,” however, sounds much pleasanter than the rundown hovels or haphazardly constructed buildings of other areas. Many of the immigrants to Bethnal Green were of French Huguenot descent, so if Mrs. Younge possesses the valuable skill of fluency in the French language, she might have the opportunity to utilize that skill or possibly find a position teaching newer immigrants. Even so, the same reasons that argue against Mrs. Younge’s residing in Limehouse and Stepney apply here as well. If we credit Mr. Bennet’s opinion that “‘Lydia will never be easy till she has exposed herself in some public place or other’” (256), living in Southwark would be advantageous, putting her in close proximity to many centers of entertainment. 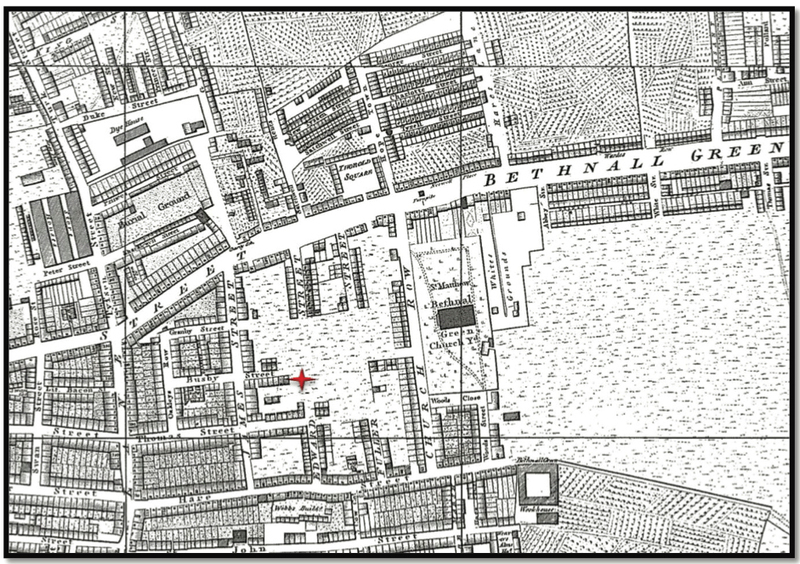 The first of them, on this map panel, is the Royal Circus, which John Wallis in 1814 describes as a place “where ballets, pantomimes, and horsemanship only, used to be exhibited; but since it has been in the hands of Mr. Elliston, it has become more of a regular theatre, full pieces being performed with very little variation from the mode observed at Covent Garden or Drury Lane” (xxxvi). To the west is Lambeth, the site of the more famous horse pantomimes of Astley’s Amphitheatre (which the John Knightleys, their two eldest sons, Harriet Smith, and Robert Martin visit in Emma), and the concerts and fireworks at Vauxhall Gardens. The patent theatres of Covent Garden and Drury Lane are a short carriage ride across the Blackfriars Bridge. But Southwark is best known to be a place of great trade. Besides dealers in hops and grain are tanners, dyers, brewers, a soap manufactory, and timber yards. Wickham would never toil in any of these industries, but Mrs. Younge could possibly let rooms to their workers. 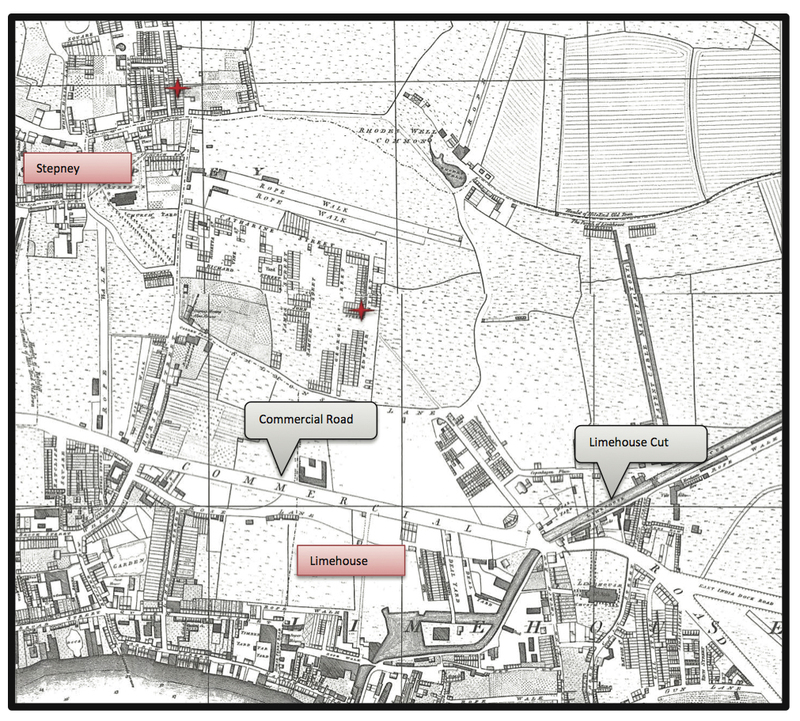 If Mrs. Younge had any conscience, she could have advised Lydia to make application to the Magdalen Hospital, a short distance away from the Edward Street on this map panel. As David Hughson writing in his 1807 history of London explains, “The unhappy women, for whose benefit this hospital was erected, are received by petition.” According to Hughson, there is “a numerous class of women, who are much to be pitied, and to whom this charity has been very beneficial; viz. ‘young women who have been seduced from their friends under promise of marriage, and have been deserted by their seducers.’ . . . No young woman, who has behaved well during her stay in the house, is discharged unprovided for” (509-10). There is another reason Mrs. Younge might reside on this particular Edward Street. We have assumed in considering the previous neighborhoods that she might be running some sort of boarding house, if not something worse, but on this Edward Street there are Almshouses for the poor of Christchurch parish. According to Roberts and Godfrey’s Survey of London, “In 1717 Edward Edwards, of the parish of Christ Church, executed a deed by which he transferred certain lands to be used after his death for charitable purposes. The first almshouses were erected in 1753 at a cost of £150 and subsequently 44 almshouses in total were built between 1777 and 1791 in Robert, Charles and Edward Streets” (115-21). Teaching in the parish’s charity school, also set up by Mr. Edwards, might be a viable option for Mrs. Younge to support herself. While Southwark is certainly not as grand a neighborhood as Mayfair, it would be a significant rise up from the eastern hamlets. In the northwest section of the metropolis, north of Regent’s Circle, are two more Edward Streets. Under the patronage of the Prince Regent, architect John Nash was commissioned in 1811 to create a grand panorama including a palace and accompanying villas. The map panel above shows the Edward Streets laid out but with nothing yet developed since construction did not begin until 1818. These two locations—though soon to be fashionable—can be absolutely ruled out as possible locations for Mrs. Younge. The last area where there are Edward Streets is the farthest west on the map—the wealthiest and most socially desirable neighborhoods. These neighborhoods were very densely populated, especially during the London season. There are three separate neighborhoods on this panel: Mayfair and Marylebone, divided by Oxford Street, and Soho, of which we see but a small part. Though technically one of these Edward Streets is located in Mayfair, since it’s on the edge of Soho, a residence here was not as fashionable as those houses nearer the elegant Grosvenor, Berkeley, or Hanover Squares. North of Oxford Street in Marylebone is another Edward Street, located off Cavendish Square. Though not quite as posh an area as Mayfair, it was known to be one of the neighborhoods where prosperous members of the rising professional classes tended to settle. 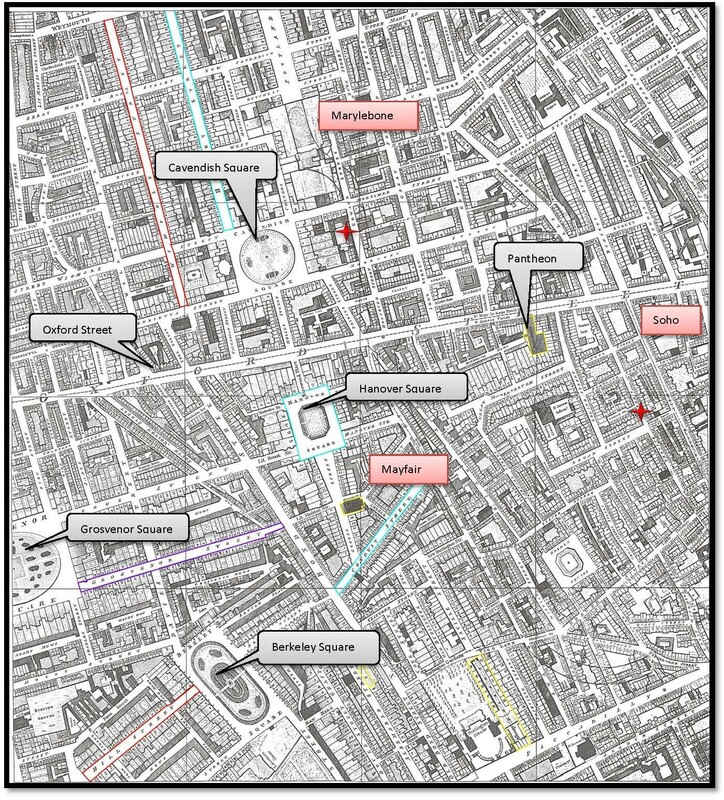 There were also several peers and notable persons too numerous to list living north of Oxford Street. 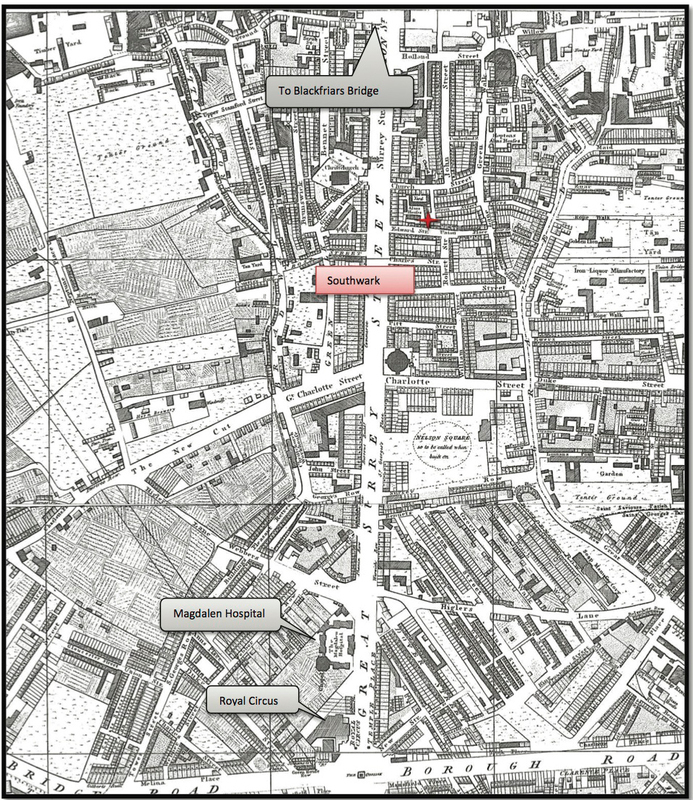 Another possible Edward Street in Marylebone is near Portman Square (on the next panel east). Mr. Horwood’s map identifies this road as Edwards Street, but other maps label it as Edward Street. Could Mrs. Younge, much less Wickham and Lydia, afford the very high cost of living in this area? If Mrs. Younge possessed the means to settle in this neighborhood, why would she need to seek employment with any family? Unfortunately, if she were living in this neighborhood, the possibility that Mrs. Younge engaged in some form of prostitution would have to be considered. Harris’s List of Covent Garden Ladies (1788) calls the area of Marylebone “the now grand paradise of love” (13). In fact, in the 1793 edition, there is an advertisement for a Miss Jo-es, No. 16 Edward-street, Cavendish-square (19). Although this review of Edward Streets eliminates only two from consideration, there is one other clue to consider. Lydia tells her sisters, “‘We were married you know, at St. Clement’s, because Wickham’s lodgings were in that parish’” (352). According to the Horwood map index, there are two St. Clement parishes: St. Clement Danes in the Strand and St. Clement Eastcheap. Map of London with St. Clement Danes and St. Clement Eastcheap. Here again is our composite map of all forty panels with each of the two St. Clements now indicated on the map. The obvious conclusion is that Mrs. Younge cannot be harboring the fugitives as none of the possible Edward Street locations are within or even near either St. Clement parish. Both parishes have coaching inns within their boundaries that would have received daily coaches from Brighton, so we need more information to rule one out over the other. One cannot miss the nearness of St. Clement Eastcheap church to Gracechurch Street. Mr. Gardiner, Lydia’s uncle, lives “within view of his own warehouses” (158) on Gracechurch Street. Is it possible that the elopers are hiding in plain sight of her uncle’s family? 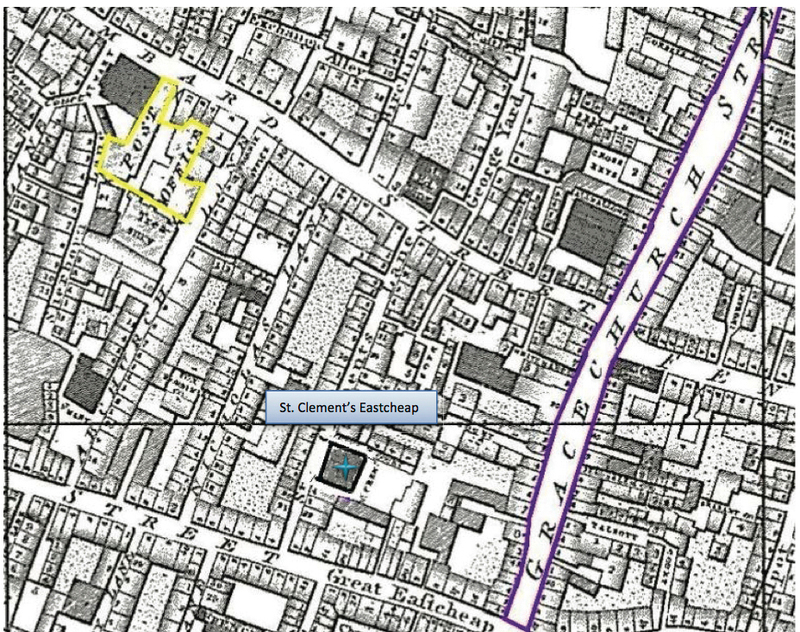 St. Clement Eastcheap is an extremely small parish: the 1811 census records only 47 houses, essentially encompassing both sides of St. Clement’s Lane, the street on which the church is located. It is doubtful that the Gardiner family worships at St. Clement’s as there are three churches on Gracechurch Street clearly visible on this map panel: St. Peter on the north end, All Hallows, almost directly across from Leadenhall Market, and just south on the other side of the street, St. Benet, the oldest of them all. While St. Clement Eastcheap may not be the Gardiners’ parish, its parishioners might very well be Mr. Gardiner’s customers or acquaintances, who could relay a sighting of the couple. One also has to wonder, if Lydia is so willful to have “‘left all her friends,’” what would stop her from going to visit her relations whenever the fancy takes her (305)? She feels no shame in displaying her relationship with Wickham to Darcy, to her relations in London, or to the Meryton community. Even as Lydia returns home married, she is described as “untamed, unabashed, wild, noisy, and fearless” (348). Other than the flush from the first fulfillment of her “high animal spirits” (49), what keeps her by Wickham’s side if she can walk a block to brag about winning what she describes as the competition to be “‘married before any of you’” (244)? The second possible St. Clement’s, St. Clement Danes, on the other hand, is a quite large and densely populated parish. Unlike the other areas considered, which are mostly homogeneous in economic and social status, St. Clement Danes contains many distinct neighborhoods, each with its own class and economic structure. To the north and east are the Inns of Court, where the legal profession is established. Just past the western edge are the patent theatres of Covent Garden and Drury Lane. In the area nearer the river, affluent housing could be found next to Somerset House, home of the Royal Academy. Yet these mostly prosperous neighborhoods hide some areas of deep poverty and squalor, containing the kind of old and crumbling medieval housing being replaced in the eastern hamlets. If Lydia chooses to “exhibit herself” on the stage, this location is the closest to London’s two most famous theatres. If Wickham still maintains a relationship with Mrs. Younge, this parish is a short distance away from Southwark via the Blackfriars Bridge and from the other possible West End locations. One hopes that Wickham has enough decency or, at least, the self-interest to settle himself and the young lady in the more prosperous areas of this parish. The various editions of Pride and Prejudice provide little further assistance in determining the location of Mrs. Younge. Chapman does not list any London locations in his Notes and Appendixes, nor does Patricia Meyer Spacks’s annoted edition contain a note of explanation for the brief mention of Edward Street. David Shapard offers the possibility that “Jane Austen had no specific street in mind” but does posit that the most likely location is the Edward Street near Cavendish Square (579). Pat Rogers in the Cambridge edition admits that “there are several candidates, but among the more plausible are two: a stretch of what is now Wigmore Street (marked by Edward Mews) . . . and a short road off Wardour Street in Soho” (532). Because of the strong possibility that Mrs. Younge is involved in prostitution, I think she is at the Edward Street, Cavendish Square location. When this exploration of Edward Streets was presented as a lecture, audiences were asked to vote on the location of Mrs. Younge’s house. Their overwhelming response was to place her in Southwark, near the Almshouses and the parish’s charity school. While it’s very interesting that the audiences want to reform Mrs. Younge and give her a happy ending, I don’t believe Mrs. Younge—who, after all, facilitates Wickham’s seduction of her fifteen-year-old charge—is capable of reform. Moreover, if she had prior acquaintance with Wickham during his earlier residence in London, she must have been sharing in what Darcy calls his “‘life of idleness and dissipation’” (223). As a “disgraced former governess” (Shapard 579), she must now sink in status. As to the St. Clement conundrum, the only editor commenting is Rogers: St. Clement Eastcheap, he argues, located “only one block west of Gracechurch Street, . . . would have put the fugitives uncomfortably close to their pursuers, the Gardiners,” while St. Clement Danes “contained areas of cheap lodging and some raffish districts, notably a part of Drury Lane; and it would have been at a conveniently safe distance from the Gardiners in Gracechurch Street.” Thus, Rogers reasons, St. Clement Danes “seems a far more plausible location” (531-32). I completely agree with his logic and conclusion, as did my audiences. While looking at a period map can provide some information in reference to a character, it’s just a superficial view unless an examination of the neighborhood culture is also included. This essay sought not only to bring those areas in Regency London alive to a modern reader but also to reflect the choices the two fallen women in Pride and Prejudice, Mrs. Younge and Lydia Bennet, would have faced living in each particular Edward Street or St. Clement parish. Abstract of the Answers and Returns: An Act for Taking the Account of the Population of Great Britain. London: House of Commons, 1811. Austen, Jane. Pride and Prejudice. Ed. Pat Rogers. Cambridge: CUP, 2006. Brewer, J. Norris. London and Middlesex: Or, an Historical, Commercial, & Descriptive Survey of the Metropolis of Great-Britain. Vol. 4 of The Beauties of England and Wales. London, 1816. Chapman, R. W., ed. Pride and Prejudice. 3rd ed. Oxford: OUP, 1932. Collins, Irene. Jane Austen and the Clergy. London: Hambledon, 2002. _____. Jane Austen: The Parson’s Daughter. London: Hambledon, 1998. Craig, Sheryl. “‘Gone to the Housekeeper with Troublesome Directions.’” Jane Austen’s Regency World July 2006: 17-19. Day, Malcom. Voices from the World of Jane Austen. Cinncinnati: David, 2006. Feltham, John. The Picture of London for 1803. London, 1803. Grose, Francis. Dictionary of the Vulgar Tongue. London, 1811. Harris’s List of Covent Garden Ladies. London,1788, 1793. Hughson, David London; Being an Accurate History and Description of the British Metropolis. J. Stratford 1807. Lane, Maggie. “Lady Susan and Other Widows: Merry, Mercenary, or Mean.” Persuasions 34 (2012): 71-82. Palmer, Alan. The East End: Four Centuries of London Life. New Brunswick: Rutgers UP, 2000. Rendell, Jane. The Pursuit of Pleasure: Gender, Space and Architecture in Regency London. New Brunswick: Rutgers UP, 2002. Roberts, Howard, and Walter H. Godfrey. Survey of London. Vol. 22. London: London County Council, 1950. _____. The Annotated Pride and Prejudice. Delmar, NY: Pheasant, 2004. Spacks, Patricia Meyer, ed. Pride and Prejudice: An Annotated Edition. Cambridge: Harvard UP, 2010. Wallis, John. London: Being a Complete Guide to the British Capital. London, 1814.